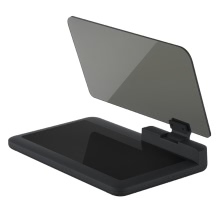 Universal smartphone holder exploits the hardened organic glass to prevent scratch and project navigation information clearly onto the panel based on optical reflection theorem. When placed on the center console, drivers don&apos;t need to bow to see GPS information on your mobilephone. They could pay more attention to the road conditions, improve the driving safety.